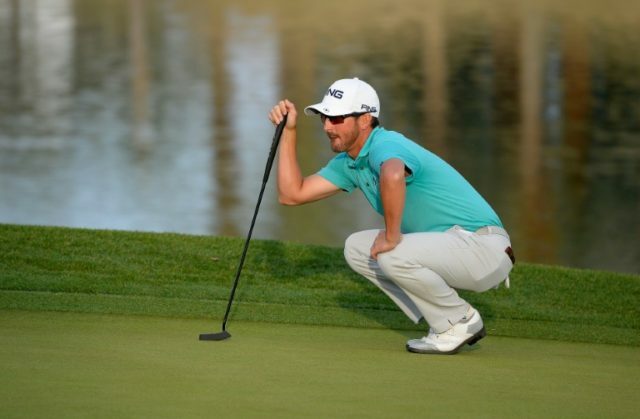 Los Angeles (AFP) – Andrew Landry fired seven birdies in a seven-under par 65 on Friday to seize a one-stroke lead over world number three Jon Rahm in the US PGA CareerBuilder Challenge in California. Landry nabbed five of his seven birdies on the back nine at the Nicklaus Tournament Course at PGA West– one of three in use over the first three days of the event in La Quinta in the desert east of Los Angeles. Landry, ranked 184th in the world and in search of his first US PGA Tour title, missed just three greens in regulation and has yet to make a bogey this week. His 16-under total of 128 put him one ahead of Spain’s Rahm, the overnight leader after a sizzling first-round 62 who carded a 67. Rahm teed off on the 10th on the Nicklaus Tournament Course. He opened with back-to-back birdies before a bogey at the 12th, He sandwiched two more birdies at 13 and 15 around a bogey at 14 before notching three more birdies coming in. It was a further stroke back to American Jason Kokrak, who had six birdies in a five-under 67 on the Nicklaus Tournament Course. Two-time major winner Zach Johnson led a group sharing fourth on 131 alongside Michael Kim and Martin Piller. Johnson and Kim both carded 64s on the Nicklaus Tournament Course, where Kim notched an eagle and six birdies without a bogey, Piller posted a 67 on the Stadium Course. Five-time major-winner Phil Mickelson, making his 2018 debut, carded a 68 on the Nicklaus course to find himself 10 off the pace. “I’ve been pretty pleased, overall, with the way I’ve been driving the ball, and very displeased with the way my iron game has been,” Mickelson said. “Usually my iron play is a lot better than what it’s been,” added Mickelson, who has hit just 21 of 36 greens in regulation over the first two rounds.